Introduced in 1975, Airlessco products have consistently been reliable for the homeowner, painting contractor, and the equipment rental industry. The Airlessco product goal from day one has been to provide superior service with exceptional value. The focus has always been on your needs. Painting and rental equipment professionals depend on their Airlessco equipment every day. Airlessco products are continuously improved to make them easier to use, more durable and less costly to maintain. The TS650 and TS900 are the ideal texture sprayers for residential interior refinishing and repairs, new-construction finishing projects and light commercial jobs. Offering a fast, high-quality finish, these durable Airlessco texture sprayers feature large material hoppers and lightweight spray guns which are designed for effortless spraying throughout the job. The TS650 is ideal for residential use and light commercial interiors. It is able to spray mainly simulated acoustic, drywall mud. The TS650 hopper holds up to 5 gallons and is ideal for the homeowner. Designed for use with a user supplied air compressor User-supplied air compressor with minimum performance of 3.5 cfm at 40 psi required for most applications. The TS900 texture sprayer is a great sprayer for residential and light commercial work. It is able to spray mainly simulated acoustic, drywall mud. The TS900 hopper will hold up to 8 gallons and is a great unit for the handyman and small contractor. The TS1500 airless/texture sprayer is the choice of the high-volume contractor that wants a machine with the ability to pump extremely heavy materials. 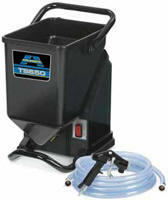 The TS1500 is the ideal pump to spray a skim coat layer of drywall mud for a Level 5 finish. The TS1500 is especially designed for heavy coatings, it has an extra long piston with the foot valve located at the bottom of the pump to give you the suction you need for those heavy coatings. Other long life features include the heavy-duty gearbox with hardened steel gears, a no maintenance toothed belt motor drive and a smooth rolling, triple chrome plated steel tube cart design with pneumatic wheels. LCD digital display offers a precise readout of output pressure from 250 to 3000 PSI with the power being provided by a totally enclosed, fan-cooled industrial quality, TEFC DC motor. The TS1500 is a ideal for large residential projects, commercial, and industrial use. It is able to spray water and oil-based coatings, 100% acrylics, block fillers, elastomerics, dry fall, mastics, epoxy, intumescent coatings, waterproofing coatings and drywall mud. The TS1500 is rated to spray approximately 7,500 gallons of paint per year, which is ideal for the small contractor.